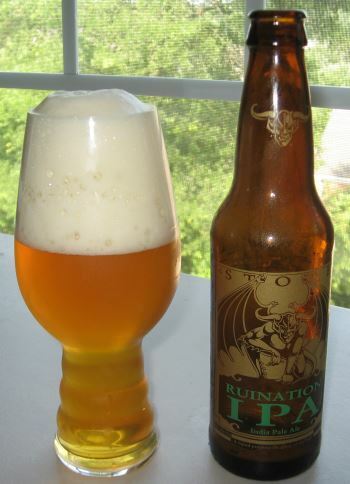 Ruination IPA is another classic that I’m not quite sure how I’ve managed to miss reviewing over these last few years. I’ve certainly drunk enough of it, one would have thought that I’d have managed to review it, but apparently not. Well, late is better than never, so here goes. Ruination IPA is an Imperial (or Double) IPA so named because it “ruins your palate.” And so it does. This is not a great beer to drink with a meal, because the intense bitterness will utterly overpower the flavors of any food you might be pairing it with. Even hot wings. Not regular hot wings, but the ones with names like “Fire” or “Inferno” or “Atomic.” Sure, you’ll still have the pain from the high concentration of Capsaicin, but you won’t be able to discern the flavor of the delivery device. It might have been a chicken wing, or pig’s foot, or the fist of a cop who’s shoved his pepper spray canister directly into your mouth. This beer will numb your taste buds like no other I’ve ever experienced. So does that mean it’s not good? No, by no means. In fact, it’s fantastic. This is the epitome of a West Coast Style Double IPA, bar none. This is the standard by which they should be measured. The nose is actually slightly sweet and floral. It reminds me of honeysuckle. The middle is bursting with citrus in the form of grapefruit and orange, the sugary sweet juice is there, but overpowered by the bitter rind. The finish is bready with hints of pine and a tiny bit of booziness. The body is fairly heavy, and the alcohol level is a strong but moderate 8.2% ABV. 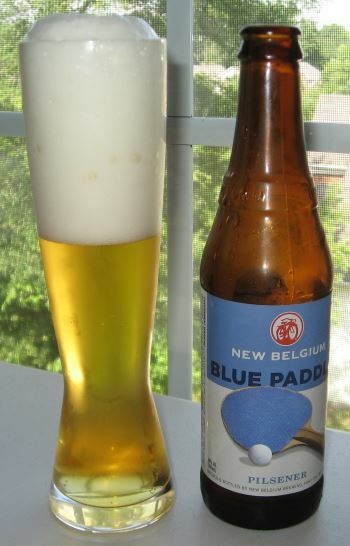 I don’t drink this beer with meals any longer, but it is one of my all time favorite brews. This entry was posted in Reviews and tagged California, Double IPA, Imperial IPA, IPA, Stone, West Coast IPA on June 17, 2014 by Xander. 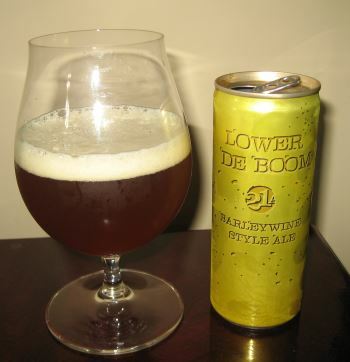 A barleywine style ale from California’s 21st Amendment Brewery, Lower De Boom is a big beer in a small can. A Red Bull® sized 8.4oz can to be exact. I can’t say for sure, but I speculate that the smaller can size is in consideration of this brew’s equally massive alcohol level of 11.5% ABV. The overall character of this beer is big, heavy, and boozy. The nose has licorice and fruitcake, and alcohol. The middle has toffee, a lot of citrus, both orange and lemon, and a ton of alcohol. The finish is sweet and it has a bit of toast, raisins, more licorice and a bit of heat right at the end from, you probably guessed it, the alcohol. This is a beer that you want to use as a digestif, and sip it slowly. When you do that, you get the chance to savor all of the rich and varied flavors, and enjoy a particularly excellent beer. This entry was posted in Reviews and tagged 21st Amendment, Ale, American Barleywine, Barleywine, California on June 3, 2014 by Xander.